Highest quality desk surfer hire from just £291.50 per week. In an ideal world contractors should be able to carry out their work in completely empty rooms with no obstacles in the way but let’s face it, that’s never going to happen! The reality is that nine times out of ten, working in the construction and maintenance business means that you have to be flexible, solve problems and work round objects that simply cannot be moved. Working in an office environment can be the most challenging of all especially when you have to carry out all your tasks working around desks, chairs and other office equipment – it can seem like a mountainous task. 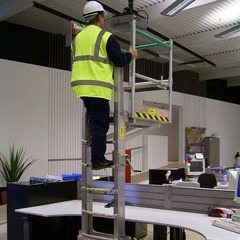 But don’t despair – at www.desksurferhire.co.uk our experts are on hand to help you get to even the tightest spots. 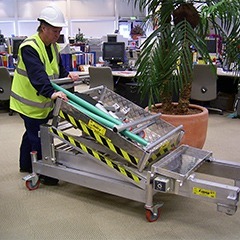 Our Desk surfers are compact and made of lightweight aluminium making them easy move around in restricted areas in fact, the equipment is so compact it will fit through a standard size door and into a small lift so nowhere is out of bounds. Other benefits include adjustable legs so you can work safely on uneven floors and the Desk surfer can also be packed flat making it easy to transport and store when it is not in use. 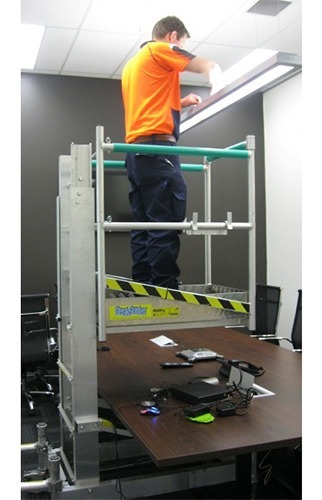 Each Desk surfer has a platform outreach of 900 mm which means you can get easy access to light fittings and ceilings in complete safety. Why hire? Let us take the headache out of getting equipment to and from the site, storage and long-term maintenance. Much of the specialist equipment on offer today can be pretty expensive to buy so hiring is often the most cost-effective option, especially if you are working on a one-off task. All of our equipment is pressure washed, inspected and checked every time it returns to us so you know it is in perfect condition although it is good practice to cast an eye over it yourself and carry out a risk assessment before you get cracking and put it to use. We also make sure that all of our equipment adheres to all the latest health and safety rules and regulations offering you total safety and peace of mind. Whether you need specialist kit such as a low-level Desk surfer or equipment which involves using a bridging system, we can supply them all starting at £291.50 per week. Not sure exactly what you need? Then give us a call – our experts waiting to help and advise you the on very best equipment for the job.